Brunch Baby Brunch! 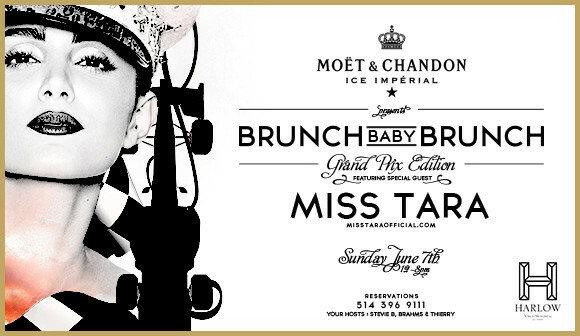 Join us for some afternoon festivities at Harlow with Moet and Miss Tara as we warm up Grand Prix Montreal’s final day! The Canadian Grand Prix is nearing its conclusion and whatever the outcome, the celebrations will be in order on the seventh of June after the clear winner emerges from the racers and the teams. But before all those in attendance are treated to the greatest party in Canada, a warm up is needed to get their heart pounding as fast as the machines on the F1 circuit. The Canadian F1 Grand Prix’s special guest DJ Miss Tara was once again tasked with accommodating the crowd. This time the task was to warm up the party goers and automobile racing enthusiasts for the party that awaits in the night for the Grand Prix’s Grand Finale party. Such an event will only attract the biggest and the brightest stars in the world. DJ Miss Tara not only has a fluency in the Tech House Music genre but also infuses her unique take on style and fashion into her performances and studio settings. She found herself in the Miss Universe Canada Contest early on and she went on to claim the Miss Photogenic award. Her modeling career today is now happily and successfully striving on the catwalk along with her international music career, complimenting her diversified sound. Fresh off the successful Indian tour, Miss Tara’s latest album that is titled “Let Live” has been developed with a contrast in her previous music in mind, with popular artists collaborating with her and a mystery Indian superstar who has also lent his or her talents to the album’s overall sound and content. To find out more about DJ Miss Tara and her next stop in her career, whether it be in the fashion industry or in the music industry, visit www.misstaraofficial.com for the latest news, her music samples, and memorable photos taken from the events she has participated in and hosted as well.